Since 1887, Sennelier Inks have been regarded as the ultimate standard of quality for fine artist. 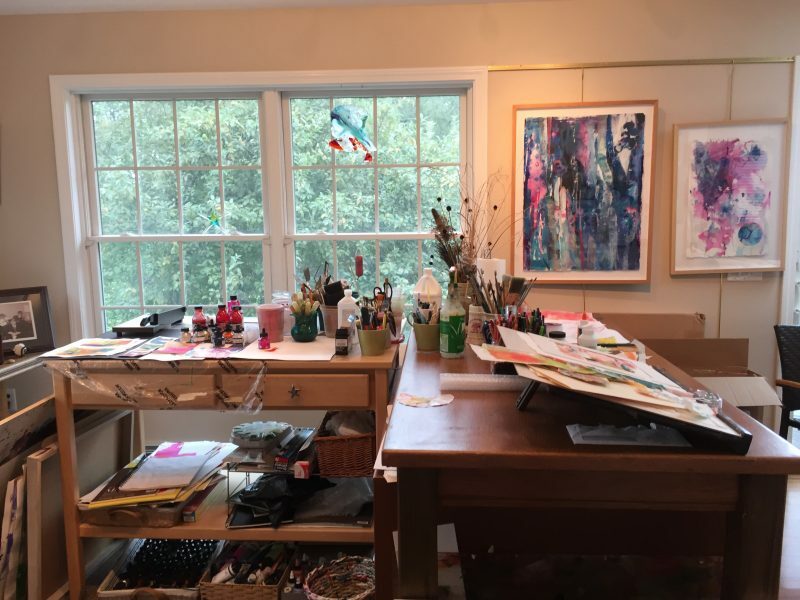 Recently I had the pleasure of visiting Diana Sartor’s Charlestown, RI studio. 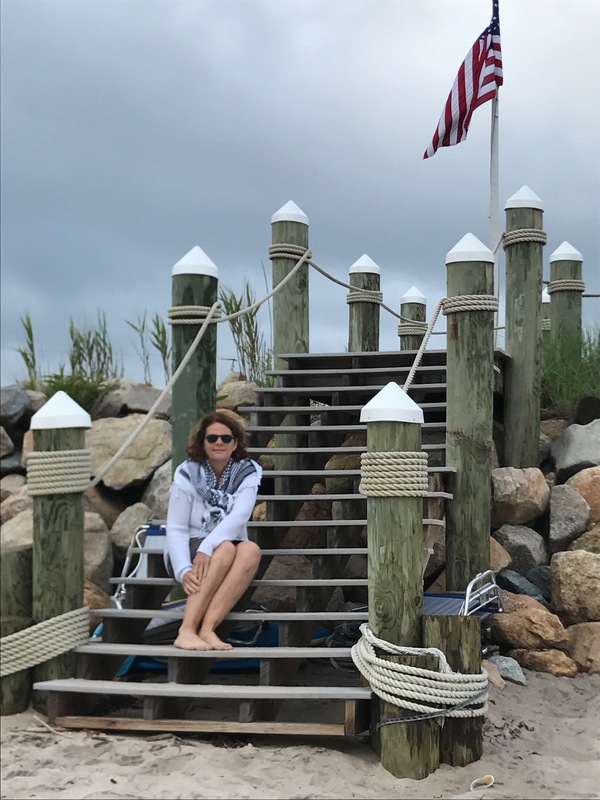 There I previewed pieces from her upcoming show, Color Waves, kicking off in August at Wickford’s Coastal Living Gallery. Diana Sartor is a mixed media artist who creates stunningly colorful and vibrant works of art using rich, brilliant Sennelier Inks. 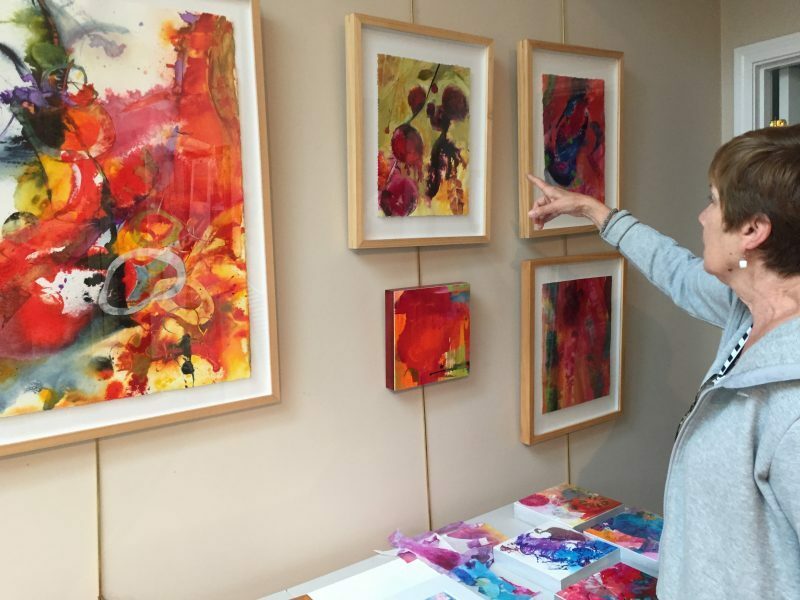 Diana Sartor’s creative process allows her to fully explore the unique brilliance, brightness and vibration of color. Collected elements of nature from Diana Sartor’s’s backyard. 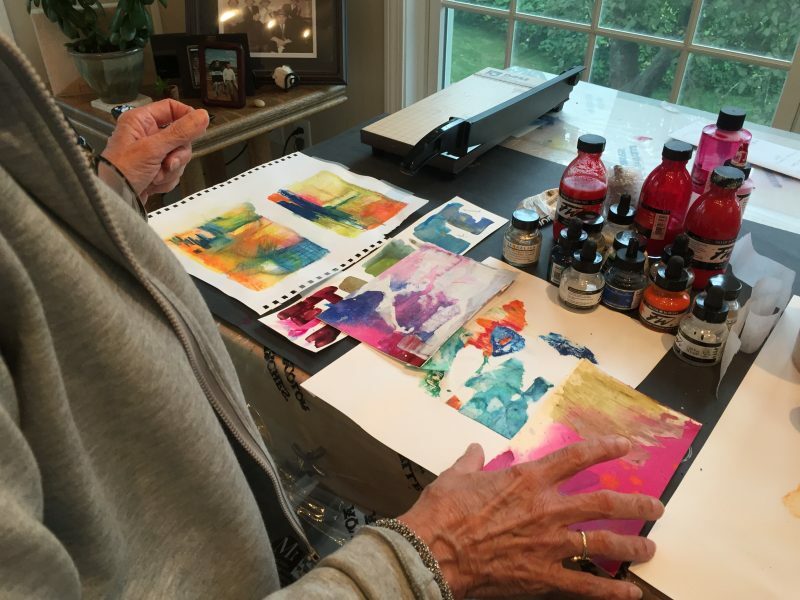 Her studio overlooks Ninigret Salt Pond which inspires her art. 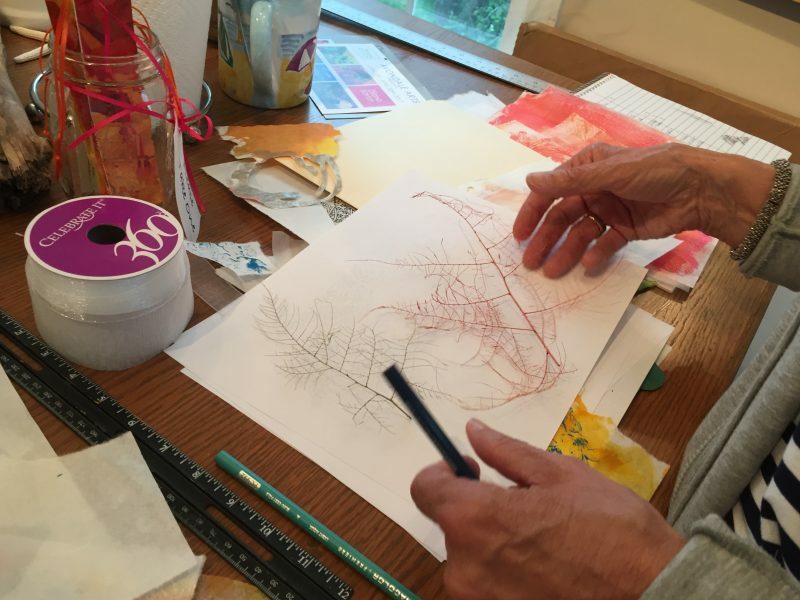 Inspiration for Diana Sartor’s art comes from nature. Her studio is an expansive space with windows overlooking a gorgeous back yard of gardens, conifers, and antique black cherry trees. Her views of glistening Ninigret Pond on the horizon is stunning. 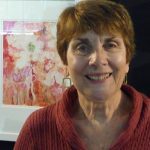 Whether Diana is creating a painting or collage, her inspiration comes from whatever captures her imagination in nature. Luckily, that is just outside her studio window. Perhaps a fiddlehead fern she’s collected along her manicured garden path, or a snow squall taking form as it dances across her yard. Diana’s studio overlooking Ninigret Salt Pond. Diana Sartor shows me some of her ink paintings & collages. 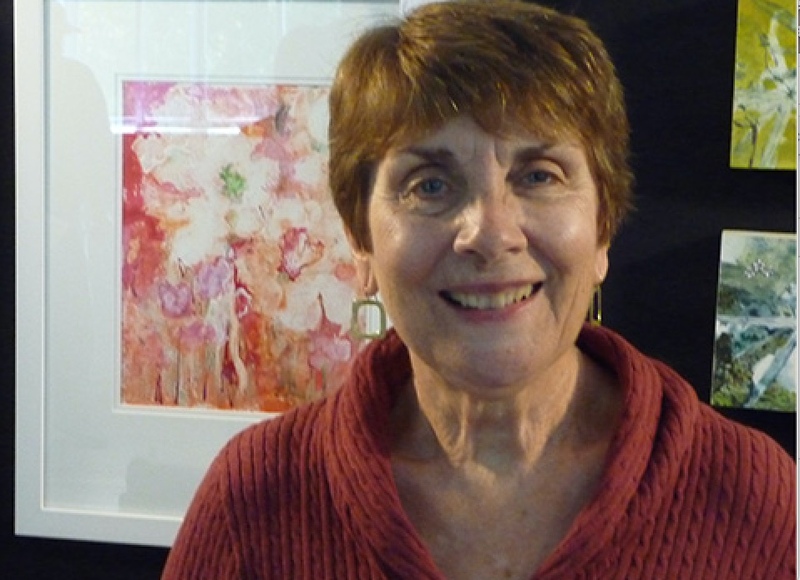 Arrange a visit with Diana in her Charlestown Studio by emailing her at dlsartor@aol.com. Wine Reception Friday AUG 11th, 2017 6-8 p.m.
Join Diana Sartor on the deck in Wickford, RI for an Artist’s Wine Reception on Friday August 11th from 6-8 p.m.at the Coastal Living Gallery . Diana Sartor’s latest exhibit can be seen throughout August, so stop by Coastal Living Gallery anytime Tuesday – Friday from 9:30-2:30! 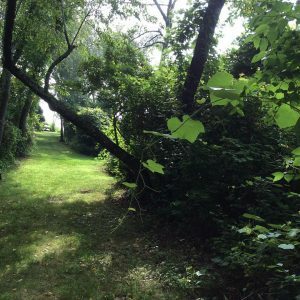 The garden path from Diana’s Charlestown studio leading to Ninigret Salt Pond. Follow Diana Sartor on Instagram, Facebook, and also visit her website at dianasartor.com where you can to gather details on all her shows and exhibits. Visiting Diana Sartor’s Charlestown Studio is a treat for the senses. There you are surrounded by the beautiful South County landscape that inspires her work. To arrange a private appointment, simply send Diana Sartor an email.